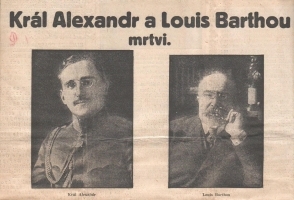 One of the cuttings informing about the tragic death of King Alexander I. The collection represents a file of newspaper cuttings collected by the Central European Cutting Office Argus Prague (Stredoevropska vystrizkova kancelar Argus – Cutting Office “Argus”, Smetanova 2, Prague-Smichov) from various Czech and Slovak periodicals to order made by the Czechoslovak-Yugoslav League (Washingtonova 1/III, Prague II) or the Czechoslovakian office of the Czechoslovak-Yugoslav Revue (Kremencova 6, Prague II). The cuttings cover all articles referring to Yugoslavia published between October 11, 1934, and November 23, 1939. Besides articles in Czech, texts in German and Slovak are included too. The articles are arranged chronologically and every single day makes a separate inventory unit. The cuttings were usually glued onto a sheet of paper and marked with a name of the newspaper and a date; page numbers and authors are not mostly included. It seems that the collection is only a part of an archive of the Czechoslovak-Yugoslav League acquired by the Slavonic Library on unknown date. The newspaper cuttings office “Argus” was founded in Prague in 1929. It was cancelled for political reasons in 1948.